Petition to law making authority to urge them to withdraw the mandate that Electric cars must have an acoustic vehicle alerting systems at low speeds. As Electric cars now are coming in more and more important numbers to public roads, as EV drivers now drove already many, many millions of EV Km in total, we can assure the silentness of our EV’s never gave a problem at low and walking speeds. We can understand that some years ago, as EV’s became on the market and public roads, there was a fear for accidents because EV’s are basically much more silent then ICE’ s.
The fear was a little bit compared when cars came for the first on the roads. 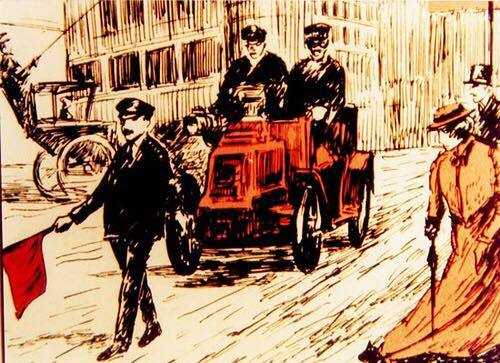 In the very beginning of cars, someone with a red flag had to walk in front of that car for security. what if soon the number of EV’s are increasing and overtaking the numbers of ICE cars? what in f.i. town centre’s, what in traffic jams? What if hundreds of slow driving EV making annoying noises? Blind people their hear organ is much better developed then that of non blind people, so on the contrary, if and by own experience, f.i. playing children at campings sites hear a walking pace driving EV, blind people will definitively hear an EV. To avoid accidents it basically is and stays the responsibility of the (EV-) driver himself to anticipate to the driving situation. To our feeling this mandate also is a little bit discriminating Electric cars. Many premium ICE cars are as silent as EV’s. Will this cars also need an acoustic vehicle alerting systems at low speeds? Many hybrid cars also are silent at low speeds. What with these cars? What with Electric scooters and Electric Motorbikes? These are also coming soon to our roads and far more dangerous then EV’s. => Also an acoustic alerting systems at low speeds? What with bicycles and electric bicycles? => these also are as good as silent. By signing, I authorize Karel Van Hilst to hand over my signature to those who have power on this issue.